Is It OK for Non-Italians to Open Italian Restaurants? Because I’ve written a book that debunks myths about Italian food in America and also discusses the sociopolitical issues surrounding Italian immigration to the United States, I’ve often thought about the term cultural appropriation as applied to Italian food in this country. How is this applied in the “real” world? I’ll demonstrate. Let’s say I’m Person X. A non-Italian person is Person Y. Person X–my great-grandparents, their daughter–my grandmother–and all of her siblings, all born-and-bred natives of Naples who immigrated to the United States because of the adverse conditions created by the Italian government in Italy in the last half of the 19th century to the early 20th century, made pizza and opened pizzerias in the United States, and then their granddaughter and daughter–my mother–and her husband, my father, made pizza in the United States. This is all MEANINGLESS, according to the current ideology and food media coming from Italy. Person Y, who is not Italian at all, with no basis for understanding Italian culture and cuisine, takes a vacation to Italy, watches a pizzaiolo make pizza in Naples, looks out at the bay of Naples, drives down to the breathtaking view of the Amalfi Coast, comes back to the United States, follows the AVPN guidelines, opens a pizzeria selling “true” Neapolitan pizza. Voila. The non-Italian is the “true” Italian, and what am I? Maybe my point is better illustrated if I’m using a different cuisine as an example. I would not be so presumptuous as to travel to Japan and sample ramen at a few well-known ramen shops, come back to the United States and open a ramen shop. I might fall in love with ramen (which I have) and try to re-create it at home, which is perfectly acceptable. However, calling myself expert enough to open a restaurant and profit from it, I wouldn’t presume to do. However, that is exactly what many people are doing today with pizza, traveling to Naples for a week, hitting the most well-known pizzerias like Sorbillo or Di Matteo and claiming to know enough about pizza to bring it back to the United States as if it’s a unique discovery and not a part of a thousand-plus-year-old culture that the Italian immigrants brought here 100 years ago. I wonder do these “Neapolitan tourists” know anything about the history of discrimination and marginalization of Italian Americans in the locales where they are opening their “true” Neapolitan pizzerias? I know, I know, I should just eat a slice of “true” Neapolitan pizza cooked by John Doe and fugetaboutit. But, I can’t do that. I can’t do that and the reason why is best expressed in this essay by Dakota Kim in Paste: “We’re Having the Wrong Conversation About Food and Cultural Appropriation.” I think she hits the nail on the head with the bolded words about the lack of real thought about the racial, ethnic and class issues involved in food production and consumption. There is a privilege in taking a trip to another country (something many Americans cannot afford to do). Many Americans are immigrants who left their home country, not because they wanted to, but because conditions were so bad that they had to find a new home. Many are not immigrants but exiles. And many cannot go back to their home country even to visit. Historically, immigrant populations have not been treated well in the United States, and as each new group assimilated, it went through a period of discrimination, some more or less, some that still continues. These immigrant groups keep a part of their traditions alive with food through the generations. Food is an integral part of a person’s identity, and yes, that means ethnic identity. Can someone take a trip to Italy, for example, for a week or a month, and eat four, five, six, ten pizzas and know everything there is to know about making a pizza, everything there is to know about the Italian history and culture, about being Italian? And what if they open pizzerias in areas with a history of discrimination or marginalization of Italian Americans? This leads me to the question that is the subject of this essay: If you are not Italian, is it cultural appropriation for you to open an Italian restaurant? As Kim mentions, well-known chefs take advantage of the American business model, and the power structure that exists that the elite have the money and therefore, the time to travel and the connections to invest in their business ventures and publicize their restaurants. The danger of this, though, is that it can redefine the food and culture in the minds of the American people and can sometimes rewrite history, which is something I discuss in my book, Authentic Italian: The Real Story of Italy’s Food and Its People. Hence, why the media can get away with saying that (the derogatory term) “red-sauce” restaurants are not “authentic” Italian cuisine and only the cuisine of contemporary Italy is. Part of me says, this is America, you should be able to open any kind of restaurant you want. If I want to open that ramen restaurant, I should be able to. If Person Y wants to open a pizzeria serving “true” Neapolitan pizza, bada bing. But the other part of me says, yes, this is cultural appropriation, and no, you shouldn’t open a restaurant if you don’t have a connection culturally to the food you are serving. While I say this, I do recognize that we live in the United States, and this is the land of the free, free market and free speech. Americans are free to open any kind of restaurant they want to, and I am free to criticize them. In the end, it is up to us as consumers, as individuals, to research the restaurants we frequent, to vote with our dollars, to be mindful of the food we eat and the cultures behind it. Paper and Salt is a very cool food blog for fans of literary history and food. The latest entry is one of Henry James’s favorite desserts: vanilla ice cream with brandied peaches. I want to try Hemingway’s bacon-wrapped trout and corn cakes. Great bits of history with fun recipes to try. It would be fun to have a literary food history potluck. Who’s in? The New York Times’ Diner’s Journal article, “I Was a Cookbook Ghostwriter,” written by Julia Moskin, has created controversy, as it claims that some chefs were not solo authors of their cookbooks. Rachael Ray and Gwyneth Paltrow are on the defensive. First, do I believe that many chefs have ghostwriters? Yes, I do. They are chefs, not writers. Writing is a skill just as much as cooking is. In today’s world, people do not want to acknowledge nor pay writers for the work they do. And writing is work. After I read the article, I had respect for Bobby Flay for admitting he used a collaborator and for respecting writers as having a craft, or skill, that he doesn’t have. I also think many chefs do not have time to write their own book. I don’t see anything wrong with admitting, like Flay, that you hired a professional writer to do the writing. How is that different from hiring a professional food stylist to style the food, or professional editor to edit the book, or professional photographer to photograph the pictures in the book? I fail to see the difference. I, for one, would respect a chef more for collaborating with and giving writing credit to an author who helps him write his book. A ghostwriter, however, is different from a collaborator. A collaborator implies acknowledgement. The very name “ghostwriter” means that the writer is a “ghost” or unseen. Now, it’s one thing to hire a writer to write your book, and another thing altogether to hire one to create your recipes. A chef shouldn’t need someone to do that. I can see someone in Rachael Ray’s or Martha Stewart’s position having staff who create recipes in her style. They have TV shows, magazines and books, and there is no way they can do all that work alone. In my opinion, it doesn’t detract from their credibility nor my interest in them. Now, I would be disappointed to find out that a chef with his own restaurants would have a book with recipes created by someone else. A chef is someone who perfects his craft, much like a professional writer does, and his craft is creating in the kitchen. I want his authenticity. I’m not sure how Gwyneth Paltrow gets into the conversation. She’s neither a professional writer nor chef. Do I believe Gwyneth Paltrow wrote her own book, My Father’s Daughter? I believe she thinks she is a professional writer and chef. Therefore, I believe she wrote her book, or at the very least, the title, because she is her father’s daughter. There’s a good article in this month’s Bon Appetit by food writer Brett Martin on the secret to La Grenouille’s golden success. The Walt Whitman Birthplace State Historic Site and Interpretive Center in West Hills, New York is conducting a foodie fundraiser–a poetry-cookbook–and is seeking submissions. The deadline is October 31, 2011. Bakespace.com‘s TECHmunch Food Blogger Conference was held today, June 11th, in New York City at the Astor Center on Lafayette Street in the Village. As part of New York’s Internet Week this week, the conference focused on ideas and tips on making a food blogger’s blog more successful, including discussions on current food trends, search engine optimization, marketing and more. Great panels of speakers were assembled for the various talks, including Bakespace.com’s founder, Babette Pepaj; Lynn Andriani of Oprah.com; Tanya Edwards of FoodNetwork.com; as well as SEO experts, blog owners and more. KitchenAid was also a sponsor and donated many wonderful appliances that were raffled off throughout the day. 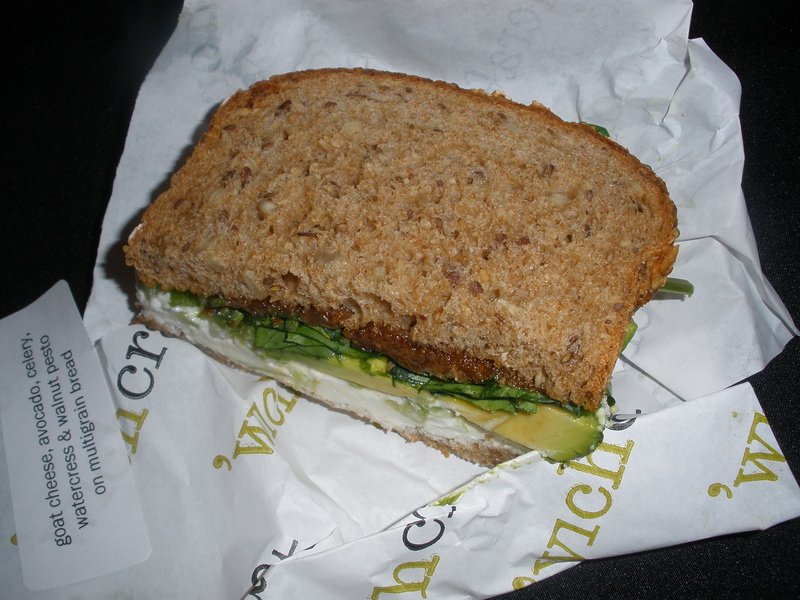 A food blogging conference wouldn’t be complete without food, and TECHmunch had plenty of it. 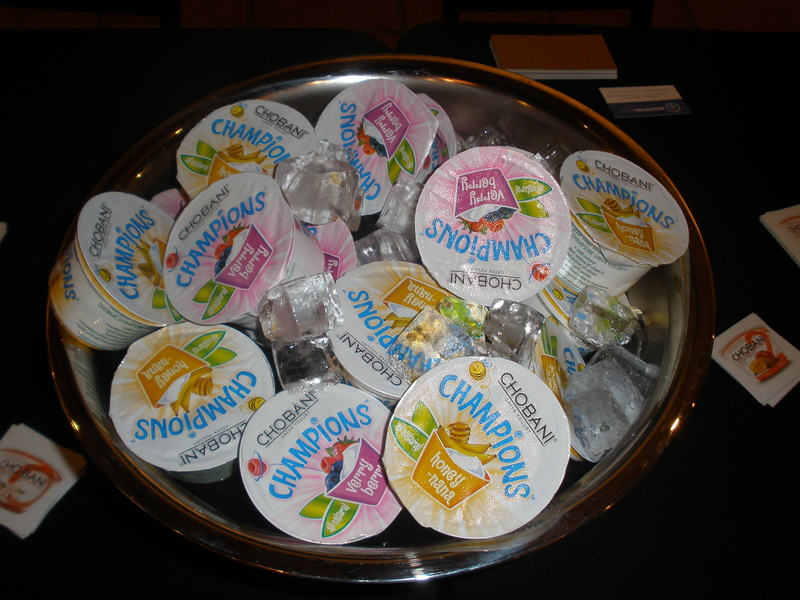 Chobani sponsored the event and served a plentiful yogurt breakfast with various flavors including its Verry-Berry and Honey-Nana Champions line. 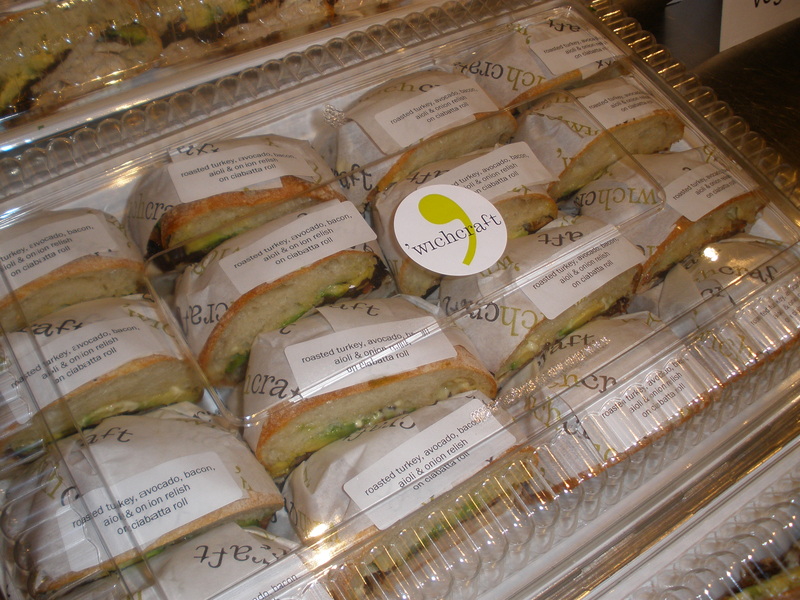 Lunch was catered–sandwiches by ‘wichcraft. Big fat chocolate chunk cookies from Jacques Torres. Cupcakes and whoopie pies from Robicelli’s in Brooklyn. These are absolutely delicious. 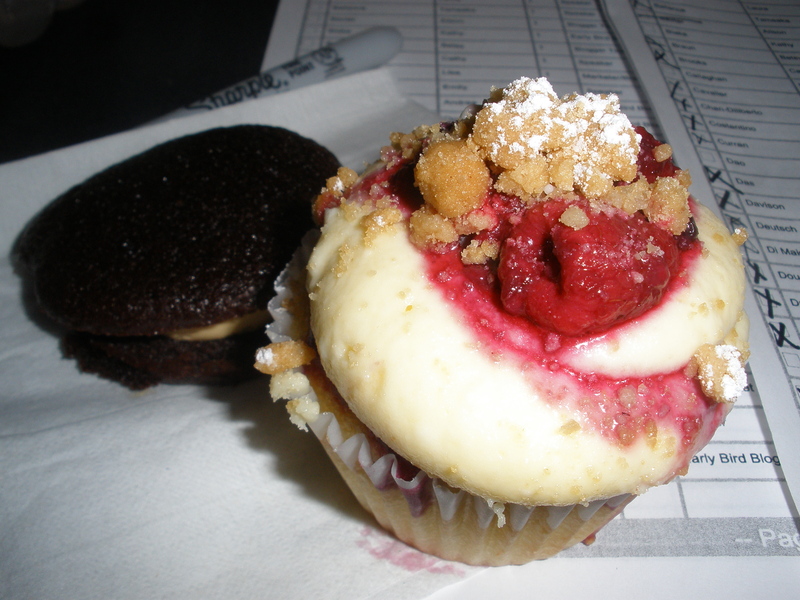 I had a frutti di bosco cupcake that was wonderful, but the showstopper was that modest little whoopie pie in the background. Though camera-shy in this photo, he packed a lot of flavor with chocolate cake and a sea salt caramel filling. So glad Emily Schildt of Chobani suggested I try one. Chobani also made peanut butter banana and berry smoothies and dips like chipotle, humus and Greek feta. Driscoll’s had a Berry Bar with mixed berry cups with ginger lemongrass syrup made on-site by a chef from the French Culinary Institute. At the end of the event, Driscoll’s gave gift bags of berries to attendees. Bakespace.com gave T-shirts in honor of the event. The conference ended with a party sponsored by The Harvard Common Press. TECHmunch is a traveling conference that was in Austin in March and that will be in Boston July 24 and in Los Angeles in the Fall. 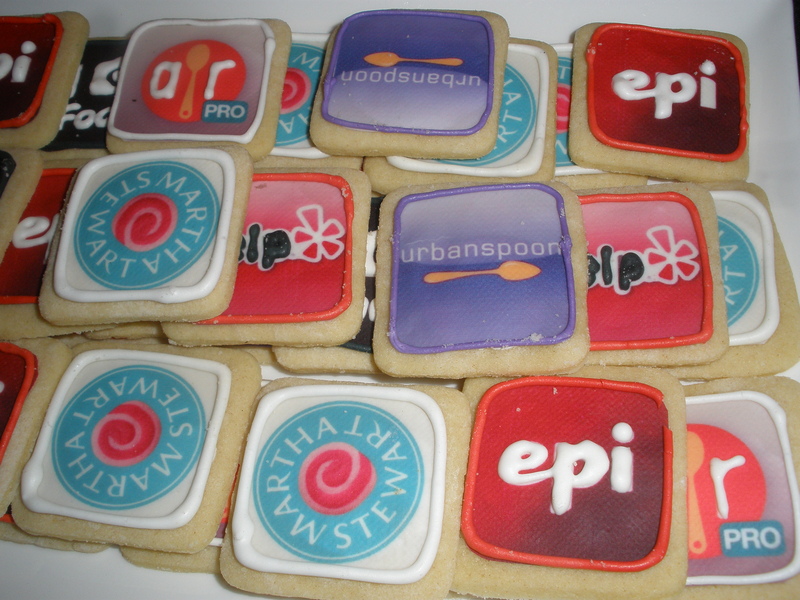 It’s a great way to meet fellow food bloggers and learn current trends in food blogging. Adorable cookies from Tasty Morsels Bakery.